Company profile of WHY PAY A LAWYER?™, the famous first paralegal of Arizona since 1989. Founded by Richard Berry, the business was first called “People’s Law”. In 1989, People’s Law truly represented a new way of doing business in the legal world. “Why pay a lawyer?” was a sales slogan that became so popular that, by the late 90’s, the business was renamed. The vinyl that started the sensation. 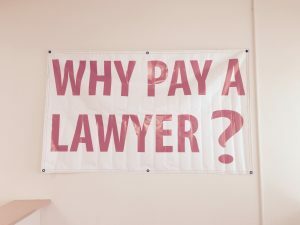 The original WHY PAY A LAWYER?™ sales banner. Read our company profile. Later, a WHY PAY A LAWYER?™ logo was developed & the name federally trademarked. 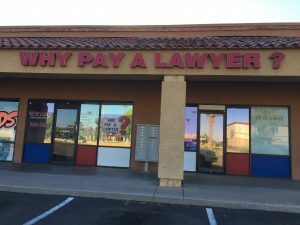 WHY PAY A LAWYER?™ has been in Tempe for over two decades, & has also had other offices throughout the valley. 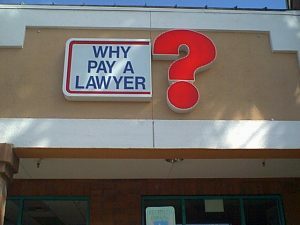 One of the early uses of the emerging WHY PAY A LAWYER?™ logo is the office sign below. WHY PAY A LAWYER?™ & the logo are federally registered trademarks. 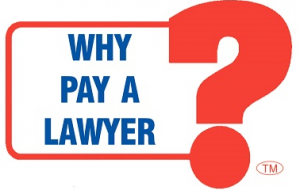 Early example of the WHY PAY A LAWYER?™ logo. Read our company profile. 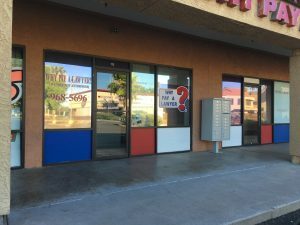 Today visit the WHY PAY A LAWYER?™ offices in Tempe, Arizona. WHY PAY A LAWYER?™ today. Read our company profile. The company employees paralegals. WHY PAY A LAWYER?™ draws on paralegals with over 50 years of experience. When you call during business hours, you’ll get a human being on the phone. Wwe take walk-in appointments, & we conduct business throughout the nation and on the Internet. Office appointments & telephone service are free. Is WHY PAY A LAWYER?™ evil? No one is evil. Except Hitler’s shifty-eyed dog. Sure, Hitler’s shifty-eyed dog is evil, ‘kay? But no one at WHY PAY A LAWYER?™ is evil. Sometimes, though, we are jerks. Don’t be confused. Peace.